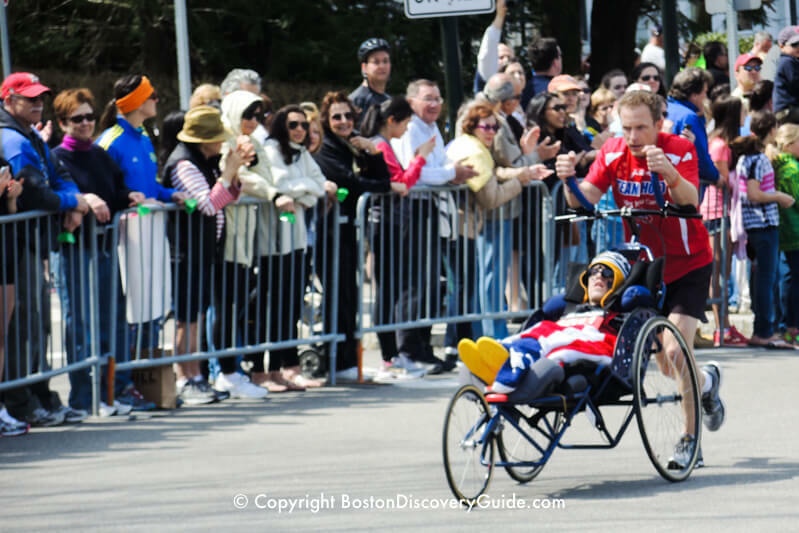 You can find terrific viewing spots along most of the Boston Marathon route. However, if you want to be sure to watch the winners as they maintain their lead position at most points during the race, you need to be strategic when you pick your viewing location. In this article, we'll give you the big picture of the Marathon route, plus a race course map and a mile-by-mile description. We'll also point out challenges the runners encounter along the course. But most important, we'll show you where to get the best views of the winners - without getting crushed by the crowds at the finish line. The Boston Marathon route covers 26 miles and 385 yards of sometimes hilly, sometimes flat terrain between Hopkinton, Massachusetts and Copley Square in Boston. The race starts in Hopkinton, located to the west-south-west of Boston, on Route 135. It continues east on Route 135 through Ashland, Framingham, Natick, and Wellesley. In Wellesley, Route 135 merges into Route 16. The race continues east on Route 16 into the Newton Lower Falls area of Newton, just to the east of Route 128, where it merges right at the firehouse onto Commonwealth Avenue (Route 30). 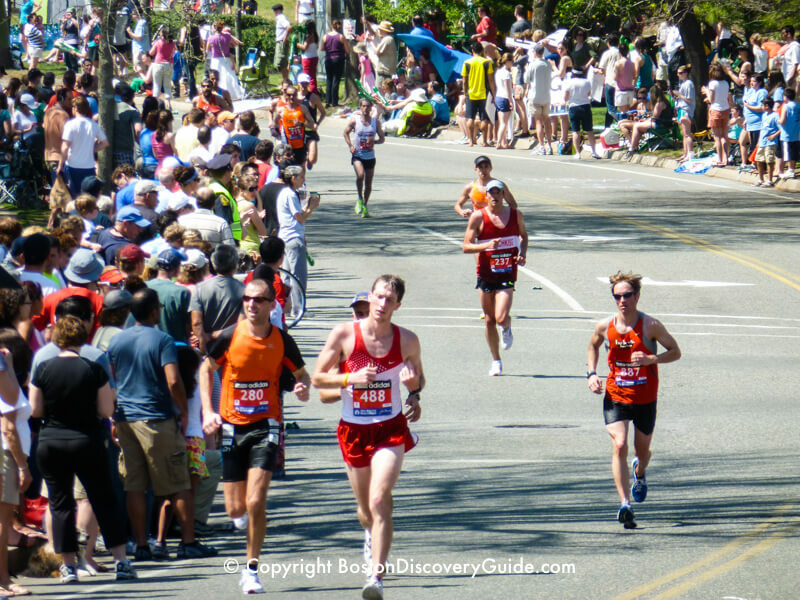 The race continues on Comm Ave through the four challenging Newton Hills, including the notorious Heartbreak Hill. At the Reservoir, racers bear right at Chestnut Hill Ave to Beacon Street until they reach Fenway Park and Kenmore Square, where they veer right onto Comm Ave again and run a few more blocks toward the city. At Hereford Street, the Marathon route turns right (don't ever try this in your car - normally Hereford is a one way street going left), and then turns left onto Boylston Street for the final 4 blocks. The race finishes in Copley Square near the Boston Public Library. You'd expect the best place to see the Marathon winners would be near the finish line in Copley Square, right? That would be true - except for the exuberant crowds packing both sides of Boylston Street 20 people deep. This give you a low chance of seeing the winners cross the finish line - and a high chance of not being able to see the runners at all. But you can still see the winners...just not at the finish line. Position yourself a few miles before the finish line, and you can be almost positive that the winner of each division will be among the first five or six racers. The most challenging stretch of the race takes place between Miles 18-21 when the four Newton Hills flatten many of the competitors (see below for mile-by-mile details). By the time the runners hit the 4th hill, the infamous "Heartbreak Hill," all but the top contenders have fallen behind. Catching up with the lead pack may not be impossible at this point - but is is close to it. You could position yourself after Heartbreak Hill, in Mile 22...but this area around Cleveland Circle tends to be crowded - and the crowds grow even larger as you get closer to Boston. 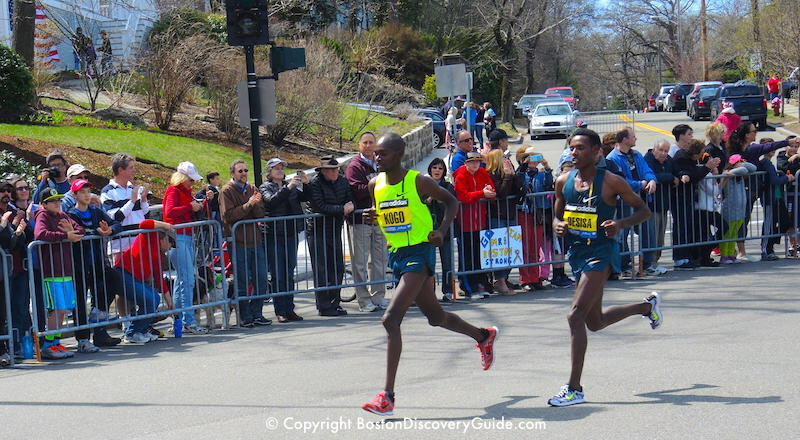 For this reason, Mile 21, right before Heartbreak Hill, is the sweet spot for seeing the soon-to-be Marathon winners. Crowds are less intense so you can easily get a great view. And chances are good that whoever is in the lead group of runners for each division has a fair shot at being the first across the finish line. Planning to drive into the city to watch the Boston Marathon? More streets are closed this year than ever before, and parking on many others is restricted. See our advice about getting to the Marathon on public transportation instead, and check out road closures and a map showing commuter rail and subway stations closest to the route. Runners gather at the Athletes' Village behind Hopkinton's Middle/High School. The Boston Marathon route begins in Hopkinton Common, a grassy green space in this once-rural, now-suburban town. The race route's elevation is at its highest here - 490 feet. Almost immediately, the elevation drops (except for a small hill after the first kilometer) as runners begin the first of several mostly enjoyable downward miles winding through the countryside past open fields and widely-spaced suburban houses. The total drop during this first mile is 130 feet. You'll see lots of large crowds of spectators clustered along Main Street here. Slightly rolling terrain, but generally pleasant and uneventful. Crowds become much thinner. Pleasant and uneventful. More rolling hills. Route 135 is just 2 lanes here - meaning one lane in each direction. The village of Ashland produces some cheering crowds, but otherwise there aren't too many spectators along this stretch. Pleasant and uneventful. More rolling hills. The route becomes less rural, with commercial areas and small strip malls. Runners encounter the first significant upward slope - a long half-mile incline as they enter Framingham toward the end of the mile. Runners leave country behind as they proceed along the Boston Marathon route through Framingham. The route becomes hillier also - three small rolling hills, resulting in a net drop of 25 feet by the end of this mile. Front runners begin to emerge, with other racers dropping back a bit. Plenty of spectators usually line up to watch here. Development becomes denser, with office buildings, factories, and stores lining the road around the intersection of Route 135 and Route 126. The route is mostly flat, with a drop by the end of the mile of another 25 feet. Experienced runners take it easy along this stretch, as the biggest challenges lie ahead. Hard to tell where Framingham ends and Natick begins. Mostly flat, with a gradual rise of about 25 feet by the end of the mile. Stores and more stores line the route. Mostly rolling terrain, but still fairly flat. Mostly flat, and less commercial as the runners first pass Lake Cochichuate, and then run through Natick's historic district. The road is flat through Natick, where the intersection of Routes 135 and 27 in Natick Center mark the first 10 miles. Lots of crowds gather around Natick Center. Development thins out, as the runners approach more suburban Wellesley. The route drops slightly, and the peaceful wooded area just to the west of Wellesley gives no hint of what is about to happen in Mile 12. The course inclines rather sharply downhill but then climbs up toward the end of the mile. Wellesley College, located near Mile 13, cancels classes for the day. Wellesley students begin lining up soon after Mile 12 to create what they call the Scream Tunnel - a wall of sound, unbroken for the duration of the race and amplified by loud music, colorful signs, high fives, hugs, and kisses to cheer on the runners as they stream past. Less than 200 yards into Mile 13 is the halfway mark. Runners turn left onto Route 16, and head through blocks lined with ritzy shops as the Boston Marathon route leads them east from Wellesley Center. Runners pass the picturesque village houses and more shops on the outskirts of Wellesley, and then cross Route 9. Crowds are usually fairly thin here. After crossing Route 9 there's a slight rise - and then after about half a mile comes the sharpest descent of the race, an abrupt 100-foot drop into Newton Lower Falls. This is where the terrain changes, and for the next 9 miles, the runners will be challenged by a series of rippling hills. Crowds are still fairly thin here. Almost immediately, runners pass the "Entering Newton" sign, and start a long half-mile plus uphill climb taking them along the Route 128 overpass. Traffic roars by below, with lots of honking from drivers who look up and spot the Marathon runners. The elevation of the overpass exacerbates whatever unpleasant weather elements may be at play - strong winds, driving rain, searing (remember, our Boston weather in April can bring nasty surprises). The course drops a bit around Newton Wellesley Hospital, and finally gets a little flatter. After going through a mostly flat residential area, runners turn right at the firehouse (which is on their left) onto Commonwealth Avenue (Route 30). Newton's four difficult hills lie ahead, and the first, "Firehouse Hill," is about to begin. This is a steep hill, although less than a half-mile long, beginning just past the Brae Burn Country Club on the right. Large crowds gather around the firehouse and along Comm Ave. From here on in, expect lots of spectators lining both sides of the route. The course curves around quite a bit, but is mostly flat, with a small net drop of 15 feet. Runners encounter Newton's second hill . . .
Just after Mile 19 begins, runners cross Walnut Street, where the "Forever Young" statue of John A. Kelley shows Boston's famous Marathon runner as a young athlete next to his older self. Almost immediately, the course - now quite curvy - begins a gradual incline. By this point, the runners are looking tired and stressed, but soon the hill becomes steeper. It flattens out a little - and then climbs again near Centre Street.
. . . and the third hill, another sharp incline just after Newton City Hall. Mile 20 begins almost at Centre Street. Heartbreak Hill, Newton's fourth hill along this stretch of Comm Ave, comes just after the shops near Centre Street and forces the runners up a winding half-mile rise to Hammond Street. The hill itself isn't horrible - but it does come at a point in the runners are already exhausted by the previous hills and all those miles. Prudential Tower comes into sight at the summit, and crowds along this stretch are large and enthusiastic. Crowds get even bigger after this point, so if being in large crowds makes you feel uncomfortable, stake out a spot at or before Mile 20. 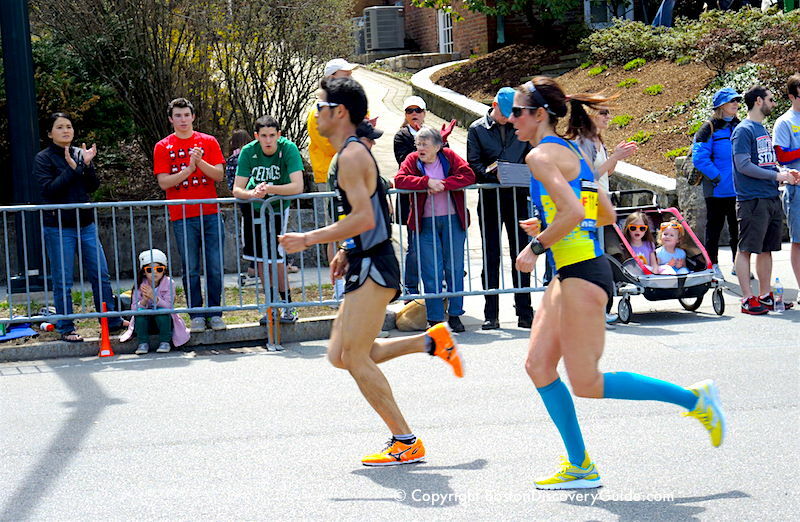 Boston Insider Tip: Why is Heartbreak Hill So Hard? If you look at this rise while watching the Marathon, you hardly even realize it is a hill. But the runners have already covered almost 21 miles and 3 previous difficult hills. Their stamina starts to ebb, and then they hit this hill that seems to go on and up forever. Runners pass Boston College at Mile 21 as the course plummets around the Reservoir, with minor ups and downs. The downward portions of this stretch are considered especially difficult - perhaps after the recent strain of Heartbreak Hill. BC's Screaming Eagles shriek, along with the rest of the large exuberant crowds. The Chestnut Hill Reservoir is on the right, just as the runners head toward the Mile 23 mark. Parts of this mile are flat, and parts go downhill - tough for the runners at this point. Crowds line Cleveland Circle, and become increasingly thicker from this point on. Boston University students line both sides of Commonwealth Ave, cheering almost as loudly as the Wellesley students. Crowds are biggest the closer you get to Copley Square - so for less congested viewing, pick a spot in a location along the way, such as Newton. Do not drive into the city! Streets start being blocked off and parking restricted two days before the race, and the number of streets affected grows each year. Runners go through Kenmore Square. From Kenmore Square, they run along Commonwealth Ave for a couple of blocks in the Fenway neighborhood and then a couple of block in Back Bay until they reach Hereford Street, where they turn right. Every year, the Red Sox play a home game at nearby Fenway Park on Marathon Day that normally starts at 11:05 (you can confirm the schedule here). As soon as the game is over, the crowd surges out of Fenway Park and pours into Kenmore Square. The fastest runners have already gone past by the time the game ends - but the crowds loud cheer the rest of the runners as they strive to complete the final mile. Runners pass the big stores along Boylston Street. Boston Marathon weather history - you may be surprised!